Darjeeling: It is a backbreaking task for 52-year-old Suren Trikhatri to sew the pieces of his life together. In the present age of ready made garments and branded apparel, survival is difficult for a small time tailor. However, with the FIFA World Cup round the corner, it is time to cheer for Trikhatri and many others like him. As football has always been the favourite sport of the people of the Hills, Darjeeling is already in the grip of the world cup frenzy. World Cup flags have been put up in every nook and corner of Darjeeling with fans extending support to their favourite teams. Flags and banners of participating countries are selling off the shelves like hot cakes. 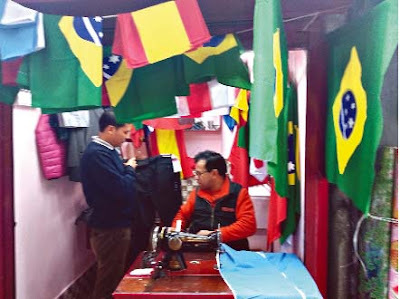 Tailors like Trikhatri are working round the clock churning out flags for die hard fans. "This is our family business. My father used to support a large family from this tailoring shop. Now, I hardly can make two ends meet. However, with the World Cup, things are definitely looking up and we expect it to be the same till the end of the tournament," stated Trikhatri. Darjeeling, once upon a time, was famous for her tailors, specially the suit stitching masters. Having been a Colonial hub, the tailor masters, as they were popularly known, were renowned for their cuts and stitches. People from all over India and neighboring countries like Bhutan and Nepal used to get their suits stitched in Darjeeling. With ready made garments taking over, soon the tailor shops will be forced out of business. Many downed shutters while others survive by doing odd jobs like mending and altering. The flags cost Rs. 150 to Rs. 400 depending on the size, number of colours and intricacy of design. "This time Brazil, Argentina, Germany and Portugal flags are in great demand," stated Anil Bhitrikothi, tailor. The market is competitive with around 20 tailors stitching flags. During the World Cup season, a tailor earns around Rs. 30,000. "If only the FIFA World Cup was held every year," sighed Majid Ali. It is a backbreaking task for 52-year-old Suren Trikhatri to sew the pieces of his life together. In the present age of ready made garments and branded apparel, survival is difficult for a small time tailor. However, with the FIFA World Cup round the corner, it is time to cheer for Trikhatri and many others like him.